Sharing a Thanksgiving meal is a wonderful way to bring together friends and family. But it can also be incredibly stressful, time-consuming and labor-intensive. For those who find the idea of roasting a turkey for hours — in addition to all the slicing and dicing that comes with making side dishes — daunting, there's a new product on the market that is sure to simplify your holiday prep time. 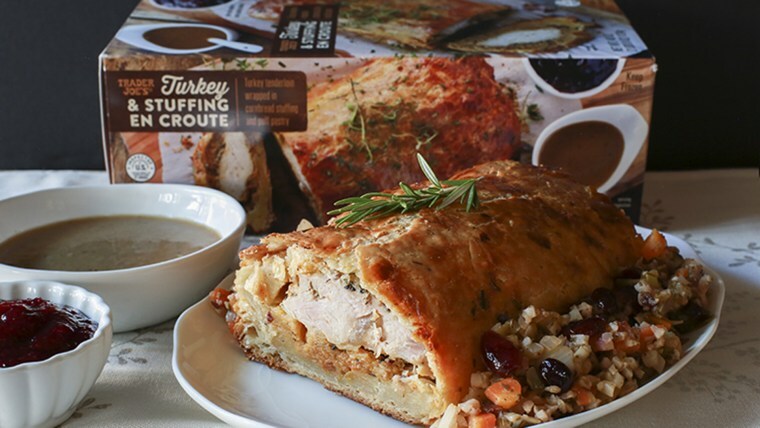 Behold Trader Joe’s Turkey Stuffing en Croute. The all-in-one dish, which serves up to eight people and weighs almost three pounds, is made of turkey tenderloin and cornbread stuffing that’s all rolled into a buttery puff pastry crust. It also comes with gravy and cranberry sauce. And unlike many Thanksgiving meals that are likely to set hosts back hundreds of dollars, this mini masterpiece is incredibly budget-friendly at just $12.99 a pop. But of course, it's not perfect. If you like to end your meal with something sweet, you do need to supply your own pie to make your Thanksgiving meal complete. The dish’s structure is similar to a beef wellington, a decadent recipe featuring a filet steak coated with foie gras and mushroom duxelles, all wrapped and baked in puffed pastry. It's a popular holiday dish around English tables. Of course if you prefer the DIY method of Thanksgiving cooking but you're still a little stressed about preparing the meal, you could also try TODAY Food’s Thanksgiving menu generator. The tool allows users to pick any dish, cooking style and prep time to find the perfect recipe to plan a full meal for family, friends and any other surprise guests. Sill worried about holiday meal prep? Take it from the pros and consider these 10 amazing tools celebrity chefs use to make Thanksgiving easier.